The Buffer-tablet is put together to bring you the important combination of different lime sorts and the appropriate bacteria, to optimize the lime and buffer effect in your soil. The Buffer-tablet also contains nutrients and nitrogen-fixing bacteria and phosphate solubilizing bacteria stems. The Buffer-tablet is specially developed to buffer new and existing plants and to slowly release nutrients as it biodegrades during the long term mineral requirements of the plants during a cycle. The tablets contain slow-release of nitrogen, natural humic acids and beneficial bacteria. This will provide an enriched soil and improve plant nutrition for a sustainable development not leaving any nutrients unused. The tablets are easy to use and need to be inserted in the soil for about 5 cm. Use one Buffer-tablet per 5 liters of soil for a complete cycle. 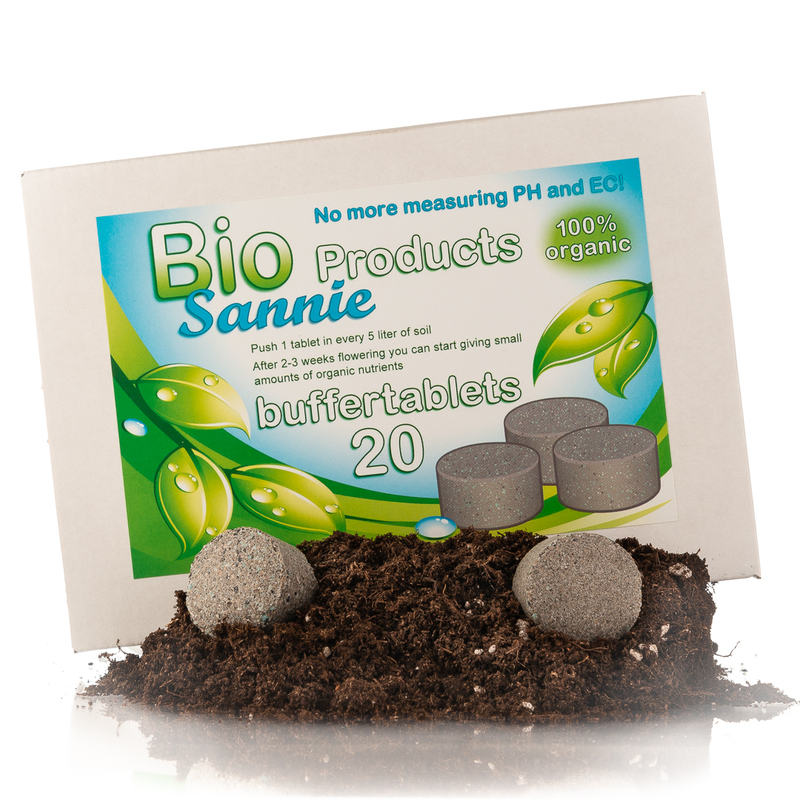 These tablets condition the soil and provide most of the required nutrients of your plants. Adding nutrients need to be done with care. Most problems for growers arise during week 4-5 of the blooming period when the lime buffer is consumed by the plants. The effects in the soil of the missing lime buffer can be noticed by the rust stains and the development decelerates. The Buffer-tablet will enable your plants to get through this period with the greatest of ease to achieve a healthy and sustainable growth resulting in full blooming plants. Fish Meal, Bone Meal, Blood Meal, Feather Meal, Kelp, Sulfate of Potash, Magnesium Sulfate, etc.